Join the discussion on our forums! 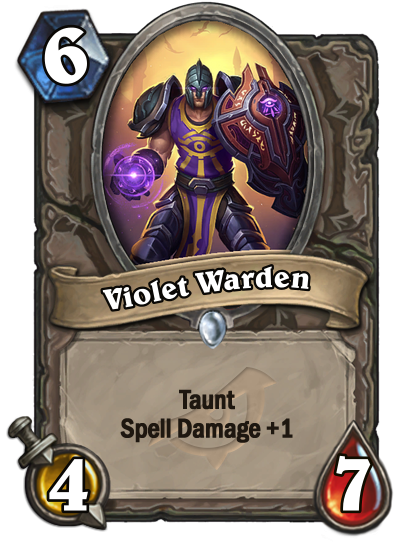 Come discuss Violet Warden over in our dedicated Violet Warden discussion topic. He's got magic, a shield, and an unwavering obsession with the color purple. Blizzard: we don't like power creeping, so we intend to not do that. I mean, circumstantially, yeah, this wouldn't be considered such by some, but face needs taunt too often for this to be anything else than a power creep. Leaving a spell damage minion for a turn with the intent of it surviving in the late game phases is something that nearly never works in constructed, while in arena, even if more likely to last, you'd probably rarely have the synergy you'd want with it, even if you manage to milk some buffed spells from it, and would nearly always prefer it to have taunt. However I look at it, constructed or arena, this is a power creep. If it was synergistic control plays or combo, they'd find something cheaper and more flexible with spell damage, as seen by how Archmage doesn't exactly facilitate any OTKs on his own. Power creep of a basic card doesn't really count ... They are all understated on purpose. Powercreep is still powercreep, though I agree, even after it, some cards don't quite make it into the limelight. Still, this one I'd say has some chance of showing up here and there, if at least in some trial runs to see if it works. Slightly mediocre as it may be, it has a few up sides that just might pull it through. Taunt + Spell Damage is such a painful thing to look at. Sleeper card. 6 mana 4/7 taunt isn't bad stats on its own, and Spell Damage +1 is a solid bonus. Don't you want to protect your Spell Damage guys by putting them behind your Taunts rather than them being the Taunts? Such an awkward card. "Archmage pOweR cReEP nERf pLz"